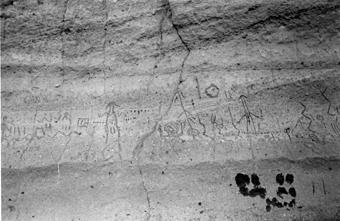 Lava Beds National Monument, a volcanic cone of rock rising above the surrounding farmlands in Siskiyou County, is covered with petroglyphs: abstract shapes, animal figures and human outlines pecked into the rock about seven feet above the ground. Extending for hundreds of feet, the petroglyphs are fenced off to protect them from vandals, but can easily be seen from behind the barrier. Their age, origin and meaning are a mystery. Though they’re attributed to the Modoc Indians, other theories abound. Perhaps the most colorful one is occult writer H. Spencer Lewis’ claim that refugees from the lost continent of Lemuria made them. Lewis was obsessed with the idea that the Lemurians were the common ancestors of both the local Indians and the Classical civilizations, and insisted that many Modoc words and place names were almost identical to the equivalent Greek and Latin words!